With Giovanni having left his position as the Viridian City Gym Leader after another loss to your trainer, Blue will have taken over said responsibilities. Unlike other Gym Leader Rematches, Blue will be far more difficult to defeat. To start, he uses six Pokemon instead of five, and all of them will be at Level 66 (with the exception of his Charizard that will be at Level 68). 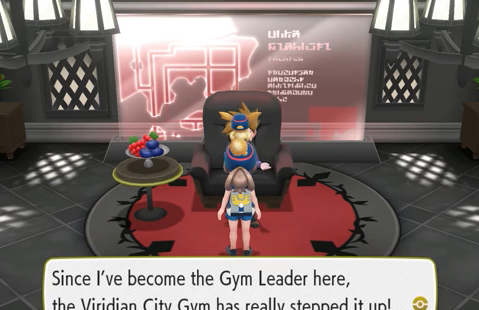 On top of this, Blue won't specialize in any one Pokemon Typing, but will instead use a balanced team of his own. In all, Blue will battle with Tauros, Gyarados, Aerodactyl, Alakazam, Exeggutor and Charizard (which will become Mega Charizard Y). Since Blue uses a balanced team with Pokemon of various types, you will need to battle him using the same. Luckily, his Gyarados, Aerodactyl and Charizard will all be part Flying Types, making them especially weak to Electric Type Attacks. His Alakazam and Exeggutor are both Psychic Type Pokemon, which means both Ghost Type Attacks and Dark Type Attacks hit them quite hard. And when it comes to Tauros, who is a Normal Type Pokemon, only Fighting Type Attacks will causes serious damage to it. When facing Blue with this team, it is almost a must to have all six of your Pokemon at Level 70 or higher.